What we have been given here close to 25 years ago, if we care to address it, is the basis of disease in the body. The statement is not qualified with respect to what type of disease is taking place, it is the basis of disease itself. From my studies, I find no important exceptions to this as it applies to the so-called “Morgellons” condition. 1. We must remain intact and structurally sound at a cellular level. 2. We must use oxygen efficiently and effectively in our bodies, as respiration is the source of all energy to the body. 3. 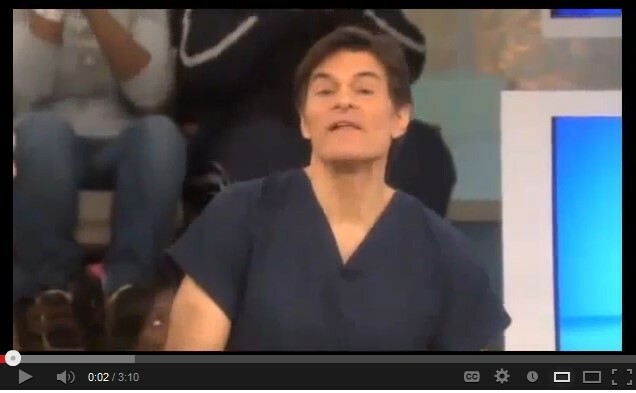 We must continue to repair the actual structures of the body to compensate for decay and age. 4. We must be able to reproduce in a healthy fashion to flourish and prosper as a species. This is the challenge that we must assume to combat disease or ill health, regardless of what the particular situation or circumstances are. It is no different here, at the most basic level of understanding, from the case of harm in general. Of course we seek to be specific as to how this is done under the specific plight of the Morgellons condition, but it is rather astounding how evident that course is when armed with the most rudimentary knowledge of pathology. Dr. Stanley Robbins will also get us off to a good start on this topic58, with his equally succinct listing of causative agents, such as physical agents, chemical agents and drugs, infectious agents, immune responses, genetic damage and nutritional imbalances. We should never miss this grand view before becoming engrossed in the detail. I have spoken earlier to those that seek a simple pill in life to take care of the complexities that are before us; I am not your person to listen to for a myriad of reasons. My course of research is one that seeks the fundamental understanding of the situation and that seeks to make this information accessible to all. Remedies to problems as needed must, therefore, also be accessible to all – at least to the highest degree possible. Specialized drugs and technologies are under the purview of others with resources, means and motive. You must seek them elsewhere. The work of this Institute is to research and educate on behalf of the general welfare and public with the resources that the public makes available to us. On a macro scale, we can see that some of the more obvious issues to be addressed concern iron disruption, amino acid presence and protein rebuilding, acidity, oxidative stress, availability of oxygen, thyroid and metabolism issues, halogen toxicity and substitution concerns, joint and skeletal integrity and elasticity, blood and cellular integrity, and potential neural disruption. Unfortunately, the list is not exhaustive but it is representative of some of the health concerns that have been brought to the forefront and reported on. One of the interesting prospects of mitigation is that improving a limited set of disrupting influences may have benefits that extend to the wider system of health. It might seem overwhelming to address such an array of problems, but the more that is understood between the relationships of mitigation, the greater are the chances of improvement to health on the whole. We must all start somewhere when we begin to assume greater responsibility for our awareness and state of health; this beginning can basically become a way of life rather than a fix to a singular problem. 2. The inhibition of the growth of iron-consuming bacteria (and bacteria-archea like) forms. A Carnicom Institute research discussion on this and related issues has also been made available to the public previously. 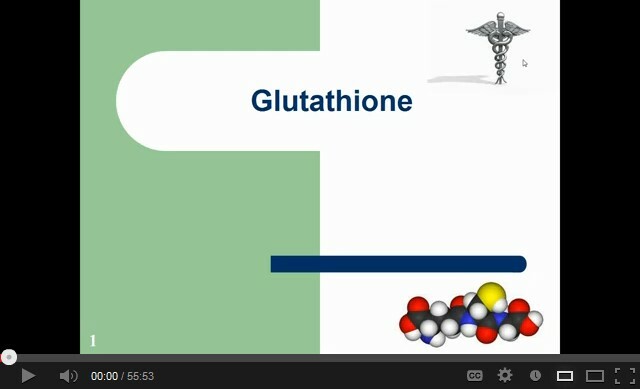 In addition, a series of videos that discuss the importance of glutathione (and its precursors) has also been included within the earlier papers. The question of whether to take a supplement of iron or not will not be discussed here; this harkens to the pill philosophy discussed earlier. This question will not only apply to iron supplements, it will apply to any and all questions that will be addressed concerning supplements of any kind. I will report on the research facts available to us all; we must then assume our individual responsibilities of action or discussion with the health professionals and advisors of our choice. It is not my role or position to be involved in any individual concerns or requests. I am not acting in any medical capacity whatsoever; I am acting fully and completely as an independent researcher. The importance of the honest and dedicated involvement of the health and medical communities should be obvious to all of us; I encourage you to force this issue as it deserves. 1. Vitamin C (ascorbic acid) helps to prevent the formation of non-soluble iron forms. 2. Vitamin C reduces iron from the ferric (Fe3+) to the ferrous (Fe2+) state. The importance of this latter statement must be emphasized again, and it is the very basis of the paper entitled “The Breaking of Bonds and the Reduction of Iron” presented in November of 201265. We can see, therefore, that iron in the ferrous (Fe2+) state is generally going to be more bio-available in the ferric state vs. in the ferric state, both from the standpoint of iron-oxygen binding in the blood as well as in the direct absorption of iron by mucosal cells. It has been shown in the laboratory through Institute research that vitamin C, NAC (N-acetyl cysteine) and glutathione have each been effective in this reduction process from the ferric to the ferrous state. It would be worthwhile to review the details of the Institute reference papers that have been cited in this report; the discussions related to glutathione and its precursors (as opposed to direct supplementation) are especially important (i.e., the use of NAC). The roles of chelation as well as anti-oxidants, as they have been discussed, should also be given full consideration for their potential benefits prior to assuming supplementation is a logical strategy. The elimination of bacterial infections in the body would, therefore, obviously be beneficial in increasing the utilization of existing iron; additional iron via a supplement might simply act as a facilitating nutrient to detrimental bacterial forms. 1. has the ability to destroy chlamydial elementary bodies. 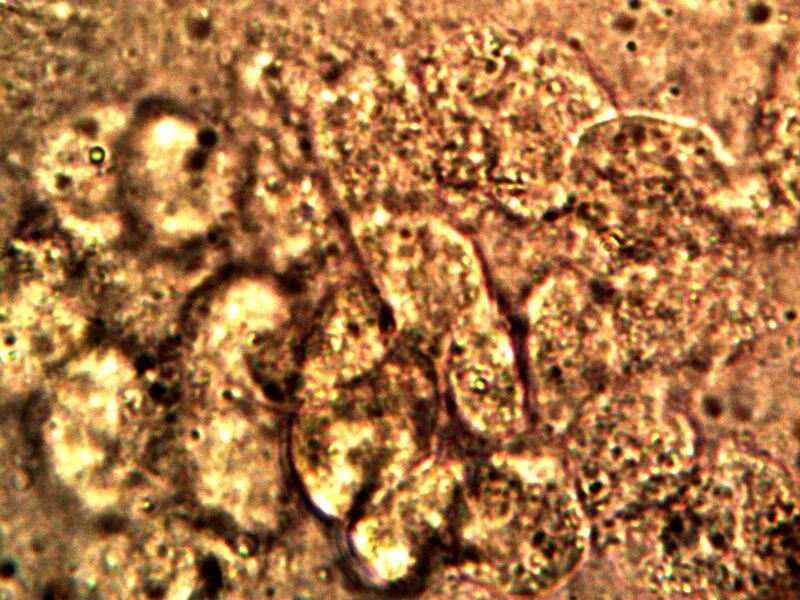 Those familiar with the research of this site will be aware of the extensive investigation and study that has been placed upon the “chlamydia-like” or “bacterial-like” form that has been repeatedly identified within the filament structures. The difficulties of eliminating that particular bacterial form have also been made apparent; hence the chronic respiratory symptoms that accompany its presence. The imperviousness of these “elementary bodies” (i.e, a spore-like form that remain dormant for extended periods) is at the heart of that difficulty. The use of NAC as an important precursor to the formation of glutathione (one of the most powerful anti-oxidants that exists) has also been previously discussed on this site. The many benefits of NAC (and also its reported anecdotal success with its use with Morgellons) can now be better understood with respect to its chemistry, its specific actions of reduction (anti-oxidation) and its precursive role in the formation of glutathione. It is also of clear and immediate interest that this same paper states that the mechanism of destruction of these elementary bodies is by the breaking of disulphide bonds within the chlamydia organism (see discussion immediately below). We now migrate to the amino acid – protein issue, and it becomes increasingly apparent that any separation of our topics is largely artificial. In addition to the withdrawal and diversion of iron from the body to support a parasitic life form, the redirection of amino acids and proteins to support such a life form is an equally serious matter. Proteins make up more than fifty-percent of our bodily constitution and they are made from amino acids; if these are interfered with in any fashion it is inevitably to our detriment. The research evidence does indicate that such interference is taking place. There are a minimum of three amino acids that exist at the top of the interest list, and it should not be surprising if there are others. The three of immediate interest include cysteine, histidine and tryrosine; again, there may well be others. The original interest in cysteine emerged from the original observations of strength of the bonds of the filament materials, both environmental and biological. The materials, from the beginning, have shown tremendous resistance to chemical and physical agents, such as acids, alkalies and temperature. This indicates, from the onset, the likely existence of disulphide bonds, which are characteristic of both cysteine and cystine forms. Cysteine is an amino acid that is characterized by the presence of sulfur, which can then further form disulphide bonds. For example, hair is largely composed of keratin (a protein), and this protein is largely composed of such disulphide bonds. This is one reason that hair is similarly so resistant to chemical breakdown. The presence of cysteine with the filament forms (environmental and biological) has been further supported by direct observation via visible light spectrophotometry in combination with ninhydrin testing. The presence of amines (building blocks of amino acids) has been further confirmed with infra-red spectrophotometry described in this report. The interest in histidine has also come about with the use of visible light spectrophotometry in combination with ninhydrin; please refer to the earlier paper entitled “Amino Acids Verified” for additional details of this earlier project67. This interest has also been extended with the knowledge of the existence of the histidine side chain in the heme (hemoglobin) molecule coupled with the observation of the extensive breakdown in the integrity of the red blood cells (erythrocytes). There is ample reason to focus on the likely existence of histidine (an amino acid) as a part of the biological filament growth form. The interest in tryosine comes solely from the current work with IR spectrometry and the subsequent relationships that have been identified with both dopamine (a neuro-transmitter) and thyroxine (a primary metabolic hormone of the thyroid). Interest in this particular amino acid is also increased due to knowledge of some of the mechanisms of aromatic chemistry, particularly the substitution reactions involving the halogens and the hydroxyl groups. These have been discussed at length in this report and they both suggest the very real possibility of structural disturbances to both thyroxine and dopamine within the body. In addition, the observed symptoms of the Morgellons condition are primary data points in our study and must not be denied. The strong presence of metabolic, neural and cognitive interference in conjunction with the Morgellons condition gives, by itself, just cause to investigate any tyrosine disruptions that may be in place. The combination of all factors above, IR observations, aromatic chemistry and reported symptoms all lend themselves to a deep investigation of the tyrosine, thyroxine, dopamine and oxidopamine issues and relationships. The research interest, as a result of all of the above, now includes amino acids and proteins in general. If there is strong evidence to show that a host of amino acids are either diverted or disrupted to support the growth of the filament structure then there is an equally strong case to consider supporting the body with those same amino acids. Amino acids and proteins are structural features of the body that give it both form and function; these proteins are to be rebuilt if they are lacking in the body. There should be no hesitation in promoting the use of foodstuffs in the body and the proteins are once such main group. There are numerous methods by which one might accomplish such an increase, such as in the use of supplements, protein powders, diet and the like. No specific recommendations on that approach will be given here, but such means are readily available for all to consider. We have already considered whey (a particular protein form that has value with iron chelation). Gelatin is another form of protein that is strongly associated with collagen production. Protein rich foods and/or protein powders may be additional forms of nourishment that can be considered in light of the findings. Again, the reader has the responsibility to develop any health related strategies with the counsel of their own health practitioner and the information here is provided from a research standpoint only. Let us turn now to the issues of oxidation, oxidative stress and free radical damage. Our first clue that a serious issue with oxidation exists is with the repeated and definitive detection of highly oxidized iron within the biological filaments and the cultures that have been developed from them. Iron in the blood is required to be in the Fe+2 (ferrous) state to bind to oxygen; if the iron is changed to the Fe+3 state (ferric) it will no longer bind to oxygen and the primary function of the blood to transport oxygen transport throughout the body is no longer properly fulfilled. The iron in the biological filament is in the Fe+3 state; this means that an electron has been stolen from the iron in the blood in the Fe+2 state, and this represents a transfer in energy, in essence, from the blood of the human to support the growth of the organism. 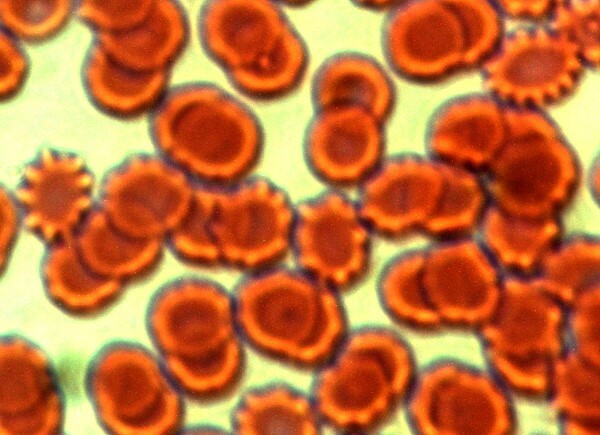 Another more direct method to investigate the state of oxygen carrying capacity in the body is to look at the blood under sufficient magnification. It has long been reported on this site that the integrity of the blood cells and the presence of the chlamydia-like bacterial structures within the blood are direct windows into the health impacts from the Morgellons condition. Please refer to the earlier paper (amongst others) entitled “A Mechanism of Blood Damage”, authored in December of 200969. In the table below are two blood slides of the same individual over a period of several years. The image to the left is during the earlier investigations of the blood as they relate to the Morgellons condition and as they were extensively reported upon within this site. The image to the right is of this same individual in a more contemporary state after considerations of the research within this site have been applied. Knowledge of the benefits of anti-oxidation strategies, along with the strategies to eliminate free radicals within the body, can potentially be demonstrated with these images as examples. Examples of variability in general red blood cell integrity and the penetration of the cell membrane by the chlamydia-like organism within the blood. The oxygen carrying capacity of the blood is severely impacted by this breakdown in cellular integrity. The role of anti-oxidants and free-radical scavengers may be worthy of consideration in the improvements that are demonstrated in the image to the right. These images are of the same individual over a period of several years of research. 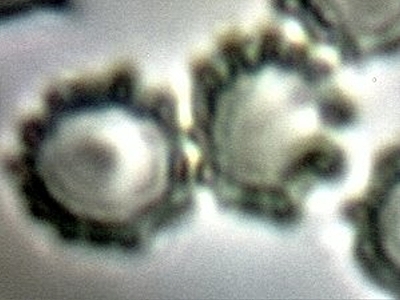 It is of interest that the chlamydia-like structures appear to remain in the serum external to the cells in the image to the right; they do not appear, however, to be successful in breaching the cell membrane as they do in the image to the left. It is presumed that the state of the immune system is a primary factor in the defensive effectiveness. A commercially prepared human blood slide presumably representative of the general population. 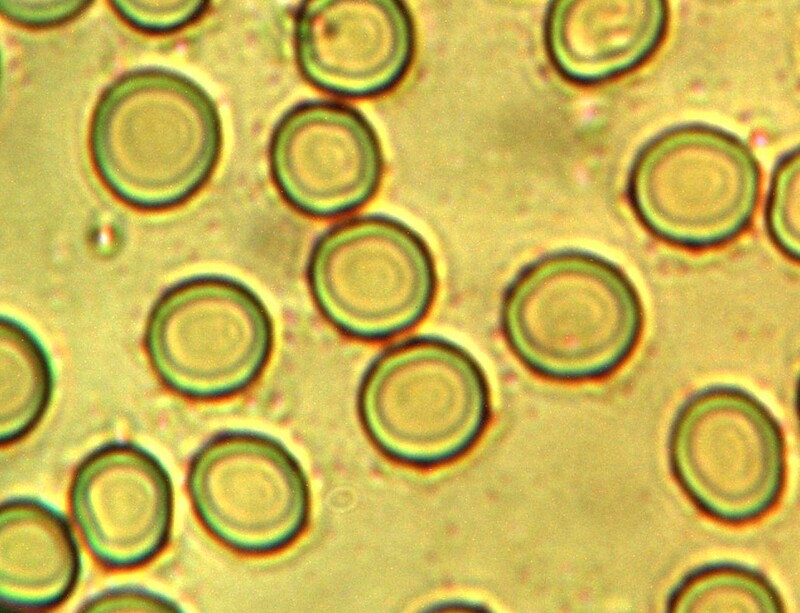 Some may consider this particular human blood slide condition as a coincidence or as irrelevant; others may be aware of strong claims by this researcher over the years that the general population appears to be subject (by varying degrees) to the health impacts of the “Morgellons” condition. Any recent statements by the National Institutes of Health (NIH) that classify “Morgellons” as a “rare condition” are in conflict with the assessment that has evolved from the research here. Another indication of excessive oxidative stress in association with the Morgellons condition derives from a study briefly mentioned within the earlier research report, “Morgellons : A Thesis”70. The particular section of the paper being referred to is entitled “A Proposed Spectral Project”. In this study, albeit with a limited sample, the results strongly indicate a deficiency in oxygen carrying capacity of the blood of a set of individuals claimed to be severely impacted by the Morgellons condition. Further, the functional group analysis from this paper reveals a host of structural features (identified, implied and plausible) that form a reasonable basis for the development of significant oxidative stress. These include (in addition to the oxidized iron – chlamydia-like presence situation), amino acid deficiencies, any cysteine deficiency, the presence of aromatic amines (with special attention to aniline or aniline-like structures, halogenated aromatic-amines and thyroid inhibitors in general, carboxylic acids and phenols (acidosis) and alkyl halides. If we assess that oxidative stress is likely a reality rather than a suspicion or conjecture, we then seek to address the problem with various strategies. Let us review what these strategies might include. 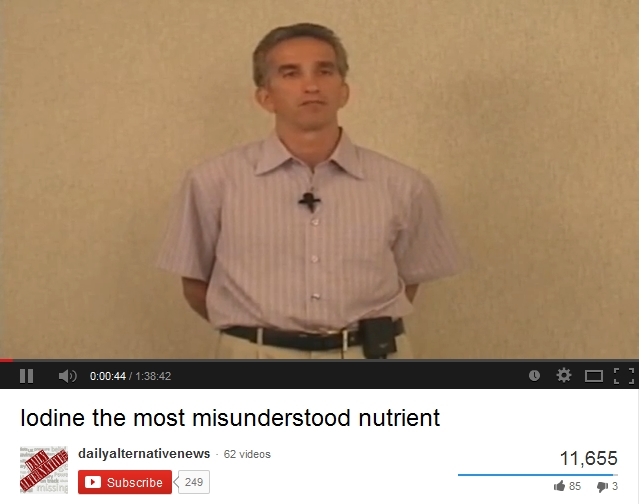 “ The research indicates that excessive oxidation is detrimental to health. This topic has also been discussed previously in an earlier paper72. Common oxidizers include the bleaches, peroxides and ozone. The research indicates, from the vantage point of this researcher, that internal use of these substances is likely to be harmful to human health. We do not solve the problem of oxidation within the body by necessarily increasing the intake of oxygen. Indeed, one of primary arguments of this paper is that the blood of the affected individual has been oxidized in a fashion that has the net effect of decreasing the oxygen carrying capacity of the blood. Excessive and misplaced oxidation also creates free radicals, which as been noted, “wreak havoc in the living system.”We do not solve that problem by taking more oxygen; we work on the problem by hindering the oxidative process. The manner in which this process is conducted in the chemical world is known as reduction. In common terms, the appropriate term is that of an anti-oxidant, and many of us are familiar with that parlance. Vitamins, across the board (A, B, C, D, E) are powerful antioxidants. An additional powerful antioxidant identified in the research is that of glutathion. The role of Vitamin C (ascorbic acid) in the inhibition of the culture growth has already been described. There remain many additional anti-oxidants of importance in human health74. It is clear that the combination of any neurotoxin with that of oxidative stress, both of which are serious contenders in the research course underway, represents a serious threat to neurological health and functioning. The list of reported, observed and research-based health impacts of the Morgellons conditions must always be at the forefront in the setting of priorities for research. The evidence of neurological dysfunction in association with the condition deserves this spotlight in combination with the findings of this report. It is of no small interest that the commonly (i.e., formerly so) attached “diagnosis” of “delusional parasitosis” (even by supposed medical professionals) appeared at the onset of public knowledge of the condition and that this occurred prior to any proper investigation or research. It is fair to ask what motives and what knowledge base were in place to support such an a priori analysis and conclusion. Continuing to present a series of references that further illustrates the extent of discussion with respect to oxidative stress, the following more comprehensive paper from Enrique Cadenas is also available78. In this paper, we find further clarification on what the term oxidative stress actually means. Metabolism, oxidation, and free radicals are an intrinsic part of the living process, and by themselves are not inherently “bad” or “good”. Cadenas explains quite simply that an imbalance between oxidants and anti-oxidants is what defines oxidative stress. This imbalance and “consequent damage to cell molecules constitutes the basic tenet of several pathophysiological states, including neurodegeneration, cancer, mutagenesis, cardiovascular diseases, and aging. A summary of free-radical formation, reactions, impacts upon health and various defenses against these effects is further detailed within this report. Recalling that free iron in the body is usually in the Fe+3 state (ferric) and that this form of iron is being definitively identified within the biological filament samples, it would seem as though the conditions for setting up an imbalance between oxidation and reduction (i.e., oxidative stress) have been satisfied. It is also recommended that an earlier paper presented be reviewed at this time, entitled “Morgellons : A Discovery and a Proposal”80. In this paper a series of direct observations and trials that show interactions between biological filament cultures, iron in different oxidation states, oxidants, antioxidants and culture growth is presented. The results of those trials and observations are in complete accord with the expected biochemical reactions of oxidative stress that are being discussed here. Now that information about the mechanisms of oxidative stress are amply available, It is time to start recalling the defensive part of the equation and to reiterate some of the many notable antioxidants that exist. These anti-oxidants form the basis for one of the primary mitigating strategies under consideration to reduce oxidative stress. Once we know the source of a problem and its likely impacts, we are in a much better position to make headway in solving it. This will be the case in terms of oxidative stress, and for other problems as well. A definite pathway for research and consultation with health professionals has been charted here for anyone that cares to regard this information. I would encourage you to consider it and evaluate it accordingly. Let’s provide a specific example of what the oxidation process entails, along with important definition of what an oxidant is. An oxidant is known by several different names, all of which are the same thing, including, oxidizing agent, oxidant, free radical, or oxidizer. An oxidant, or free radical, by definition, is “any species that contains one or more unpaired electrons occupying an atomic or molecular orbital by itself.82” An oxidizer will essentially aggressively seek an electron from another species to form a bond with another atom or structure. 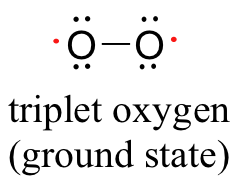 The diradical nature of oxygen, showing the two lone electrons of oxygen. The special reactivity of oxygen can be understood more readily with this interpretation and understanding of oxygen bonding. “Over the years of evolution the human body has developed a whole arsenal of antioxidative enzyme systems and vitamins for its protection. Antioxidant systems of the body are critically dependent upon external dietary sources. What are these exogenous antioxidants and where are they found? The vitamins particularly vitamin A in the form of beta-carotene and other carotenoids, vitamin C or ascorbic acid, and vitamin E as tocopherols and tocotrienols function as independently active natural dietary antioxidants. Minerals are the other dietary antioxidants that are critical to the activation of vital antioxidant enzyme systems in the body. Selenium is required for the antioxidant activity of the enzyme glutathione peroxidase. Zinc is essential for the activity of at least 90 enzymes including the antioxidant enzymes catalase and superoxide dismutase. Copper and manganese are also needed for superoxide dismutase activity. Vitamin A and its polymers are available from brightly coloured vegetables and fruits such as carrots, apricots, dark green leafy vegetables like spinach, red, yellow and green peppers, sweet potatoes, and blue-green algae. Vitamin C is obtained from lemons, limes and other citrus and sour fruits. Vitamin E is found in nuts, whole grains, vegetable oils and to some extent in fruits and vegetables. In general, minerals are available naturally from fruits, nuts and lentils, whole cooked and germinating grains, shell-fish, vegetables and many others. Many other naturally occurring antioxidants that have been studied are pycnogenol from pine bark, grape seeds and red wine, lycopenes from tomatoes and beets, and coenzyme Q10 from red lean meat and blue-green algae. Garlic, tea and blueberries are also rich in natural antioxidants. Life on Earth evolved in the presence of oxygen, and necessarily adapted by evolution of a large battery of antioxidant systems. Some of these antioxidant molecules are present in all life forms examined, from bacteria to mammals, indicating their appearance early in the history of life. SODs are metal-containing enzymes that depend on a bound manganese, copper or zinc for their antioxidant activity. In mammals, the manganese-containing enzyme is most abundant in mitochondria, while the zinc or copper forms predominant in cytoplasm. Interestingly, SODs are inducible enzymes – exposure of bacteria or vertebrate cells to higher concentrations of oxygen results in rapid increases in the concentration of SOD. Glutathione peroxidase is a group of enzymes, the most abundant of which contain selenium. These enzymes, like catalase, degrade hydrogen peroxide. They also reduce organic peroxides to alcohols, providing another route for eliminating toxic oxidants. In addition to these “big three”, there are numerous small molecules that function as antioxidants. Examples include bilrubin, uric acid, flavonoids and carotenoids. “Glutathione may well be the most important cellular defense against damage by reactive oxygen species [free radicals]“. A few other points related to the glutathione issue bear repetition within this current collection. It has been described in earlier papers that glutathione is another one of the cases where direct supplementation may be of little value. If we suppose that a body is lacking in a particular compound, substance, or enzyme, for example, a common instinctive reaction by many is that somehow it should simply be taken as a “supplement” to fulfill that deficiency. This approach can be both unwise and foolhardy as our previous discussion on iron substantiates. When information becomes available, it is of little value unless it has been interpreted properly and comprehensively. It is another of the many reasons that professional health and medical counsel is to be sought and why education must be a lifelong pursuit. There are risks in assuming that we know more than we do. In that discussion, it was communicated that direct ingestion of glutathione appears to be of marginal value in human health. The emphasis in glutathione production within the body appears to revolve heavily around the precursor biochemistry of glutathione, more than with glutathione directly. The role of N-acetyl cysteine (NAC) has already been discussed in that regard in the previous papers mentioned. It may be wise to become familiar with that the role of “precursors”, especially as they relate to the glutathione issue. Over simplification of a problem and the seeking of immediate rewards without proper understanding and comprehension can have their own price in our lives. The case for immediate and intensive participation by the health and medical communities to solve the health problems before us is patent. Another topic of developing interest, especially in light of the current research findings, is the role that glutathione may assume in combating neural disorders, such as Parkinson’s Disease. We are forced to consider the prospect of neural toxins (e.g., oxydopamine related compounds or structures) as being a potential component of the biological filament growth form. This discussion has already taken place within this paper to some extent. What is of interest here is to reacquaint ourselves with an introductory library of media on the glutathione issue, as also available in the earlier paper referenced96. An example of the Oxidata(TM) test for oxidative stress and free radical production. This test result indicates a high level of oxidative stress for this individual. Clearly, there is more research and work to do, but the point has been made, and I suspect that it is an important one. The next impact upon health that we transition to is that of excessive acidity, or acidosis. There is significant evidence from the research of record to implicate a serious acidic component to the Morgellons condition. The effects of excessive acidity in the body have been previously discussed, including demineralization, low energy, dental decay, weak immune system, chronic digestive problems, joint pains, bacterial and fungal infections, and many others. Please review that section of this paper to recall the numerous and significant health effects that can accrue from over-acidity within the body. Our desire here is to suggest what means might exist to counter the many problems are know the result from acidosis, and to suggest means by which extent of the problems might be monitored. Researching the available literature, it is apparent that there is a fair amount of controversy regarding the strategies to counter the effects of excessive acidity. There are individuals that claim that eating certain food groups are effective at changing the acid state. There are individuals that claim that drinking water that is alkalized, often by various devices or with additives to the water, will result in beneficial effects. 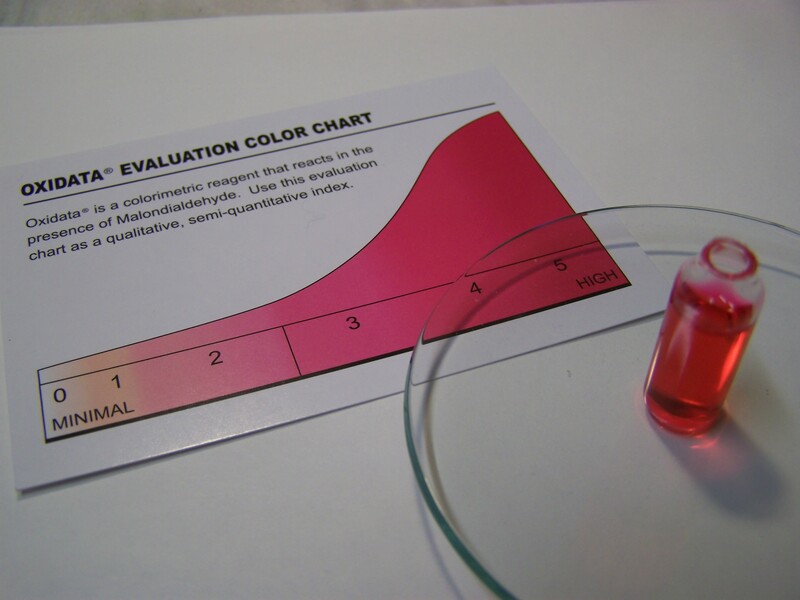 There are individuals that claim that testing the pH of either urine or saliva is representative of the body chemistry. There are individuals that will attempt to refute all of the above claims. This section of the paper is neither to advocate or to dismiss potential methods that be beneficial; it is to increase awareness of the importance of the issue and to provide a modicum of education to point the reader to various possibilities for further research, advice or action. The process of becoming aware of an idea or method does not imply or state endorsement, agreement or disagreement for that matter; it is to inform us of choices and research ideas. 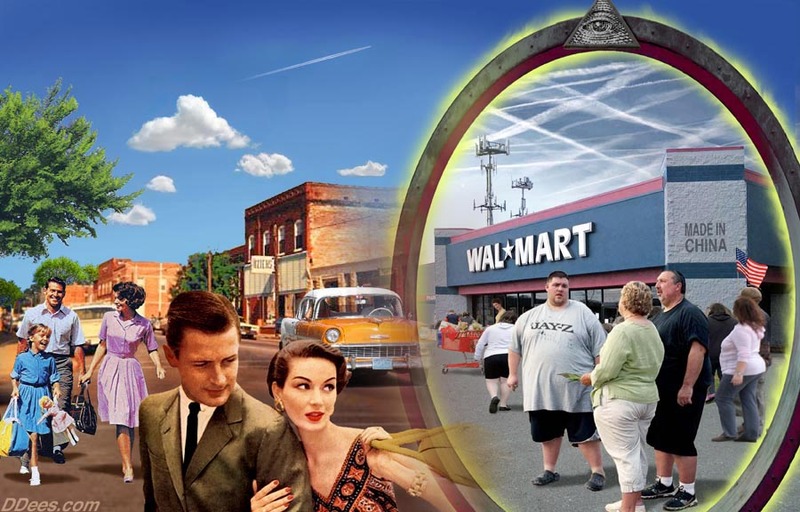 What is clear is that a fair amount of controversy exists on this particular subject; usually in such cases there is an abundance of misinformation or disinformation (intentional or otherwise) that must be sorted through. The profit motive of advocating certain and particular strategies, means, products and devices must also be considered in this regard. One method to approach this problem is to focus, at an introductory level, on the medical condition of acidosis and to learn what are the identifying characteristics of that problem. The term itself is usually used in a strict medical sense applying to reduced pH of the blood, however, it is also sometimes used to express generalized excess acidity at the cellular and tissue level. Acidosis in the strictest sense of the term may well be a medical emergency, but we can use a study of that condition to our advantage to understand what systems of the body are being most seriously impacted. It may then be considered from that point on as a matter of degree as to how much the body may be impacted by excess acidity and to what extent. We can start with the definition of acidosis itself. Acidosis is an “increased acidity in the blood and other body tissue. If not further qualified, it usually refers to acidity of the blood plasma”97. Note here that there is no requirement from the onset to restrict our discussion to the issue of blood only, as it is not required by definition. The measurement of blood acidity (pH) is not a common affair for the majority of us, and we prefer to not restrict our methods of measurement to that method alone. Another very important statement within this same article to recognize is that “the rate of cellular metabolic activity affects and, at the same time, is affected by pH of the body fluids”98. We will keep this statement close at hand, as we shall see that the issue of cellular metabolism will be at the heart of excess acidity within the body. We can once again see that we are in no way restricted to the consideration of blood alone when we are dealing with the determination of acidity within the body. Measurement of additional body fluids, such as saliva and urine, already appear to be reasonable to consider in our scope of acidity assessment, especially in a relative sense. It is also a fact that the pH of urine is regularly used as a diagnostic aid in the medical professions. Low pH values (i.e., high acid) of urine are indeed indicative of acidic conditions within the body, especially for those at risk of producing urinary stones99. The measurement of the pH of urine does indeed appear to be a viable point of measurement for acidic conditions within the body. One might also presume that such measurements could also be useful in a relative sense, i.e., to indicate changes of acidity within the body over a period of time. Before seeking out the root causes of acidosis, it is worthwhile to mention that acidosis comes in two primary forms, metabolic acidosis and respiratory acidosis. Metabolic acidosis can result from the increased production of metabolic acids (please recall the discussion of organic acids earlier in this paper and the relationship to the carboxylic acid functional group) and kidney disturbances that excrete excess acids. Lactic acidosis is a form of metabolic acidosis and it is characterized by low pH in the body tissues and blood. Respiratory acidosis results from a buildup of carbon dioxide in the blood. We refer to Dr. Michael Lam, once again, for a more lay interpretation of the importance of pH to body chemistry and for important sources of acid increase within the body. Dr. Lam will also reveal to us the primary mechanisms by which the body compensates for this change. Furthermore, Dr. Lam will make the case in his article100 that diet, in addition to other measures, is indeed a significant factor in affecting a change in acidity within the body. This will come as no surprise as we investigate further the root causes of acidosis. 1.) The metabolism and/or incomplete breakdown (oxidation) of foodstuffs or metabolic “waste” produced as a by-product of cellular activity. During normal cellular respiration and energy production , acids as produced as part or “waste” products. These acid must be “balanced”, neutralized, or removed by the body’s buffering and detoxification systems through the kidneys, lungs, liver, and blood. 2.) The consumption of acid present in the food, air, and water supply. Nitrogen emissions from automobiles and industrial plants, food dyes, sprays, waxes, preservatives, additives, artificial sweeteners, fertilizers, water pollutants, and even chloride and fluoride in tap water are just some of the highly acidic chemicals are ingested by millions everyday. How does the body overcome the acidity? The body undergoes an natural and ongoing balancing act constantly. Underlying regulatory forces work continually to balance an acidic body chemistry to remove excess acid and return the body to a more neutral state. a. The production of bicarbonate from the organs and cells of the body. b. The removal of minerals such as calcium from bones to be used as buffering agent to neutralize the acid. This is one of the leading causes of osteoporosis. c. The blowing off CO2 or carbon dioxide from the lungs. Carbon dioxide is an acid. It leads to symptoms of shallow breathing and hyperventilation. d. The release of alkaline bile from the liver and alkaline digestive secretions from the pancreas and the retention of sodium from the kidneys in response to the secretion of the hormone Aldosterone. Aldosterone is produced from adrenal gland, and stimulation of this gland leads to the feeling of internal “stress”. For those seeking a somewhat more detailed explanation of how the body compensates for an imbalance in pH, it is instructive to examine the medical model approach. In the paper entitled “Acid Base Balance in Critical Care Medicine101“, we find a modeling process that is applied to this problem that further confirms the statements in lay language by Dr. Lam above. This model introduces the balance that occurs in the body extracellular fluid between positive and negative ions, primarily that of sodium, potassium, calcium and magnesium on the positive side and the chloride ion on the negative side (i.e., Strong Ion Difference). Furthermore, it will be stated that a decrease in these positive ions will increase the hydrogen ion concentration (the very definition of an acid) through the buffering system in the body, resulting in acidosis. This modeling process is essentially equivalent to what has been stated by Dr. Lam, i.e., demineralization will accompany acidity within the body. Respiratory: When breathing is inadequate carbon dioxide (respiratory acid) accumulates. The extra CO2 molecules combine with water to form carbonic acid which contributes to an acid pH. The treatment, if all else fails, is to lower the PCO2 by breathing for the patient using a ventilator. As we continue to strike toward the heart of acidosis, at least from the more critical medical emergency perspective, one cannot help but notice that efficient aerobic respiration, complete metabolism and the lack of oxidative stress are at the absolute core of the issue. These issues have emerged time and time again within this current research, and it would be foolhardy to ignore this deep-seated theme at this point. In addition, we have learned that demineralization of the body (e.g., degradation of bone and teeth as examples) are expected to occur as a result of an acidic condition because of the body’s natural buffering systems that attempt to maintain ionic balance within the blood and body fluids. “The growth of the bacterial-like organisms that appear to be at the foundation of the so-called Morgellons condition has been positively inhibited…The basic strategy that has been adopted is a transformation of the growth environment to a more alkaline condition along with adding specific antioxidants that are directed toward the scavenging of the hydroxyl radical. We turn now to an additional important means to alkalize the body, that of bile production by the liver. …”Improving the flow of bile in the system to further alkalize the body and aid the digestive system. The liver, the gall bladder and the bile duct play an extremely important role in alkalizing the digestive tract. For those that demonstrate a persistent acidic condition within the body it may be beneficial to learn of the importance of bile production and its alkalizing function. There are recent observations of liver tissue that are important to be briefly introduced at this time; the subject will be discussed in more detail at a later date. If the body is unable to process the toxic load placed upon the digestive system, there will be an accumulation of these toxins within the body. The function of the liver is manifold, and detoxification and waste removal is foremost on that list. The liver is also responsible for protein synthesis, the breakdown of fats with the production of bile, glycogen storage, decomposition of red blood cells, iron regulation, and many others. We only have one liver and we cannot afford to have a serious problem with it. 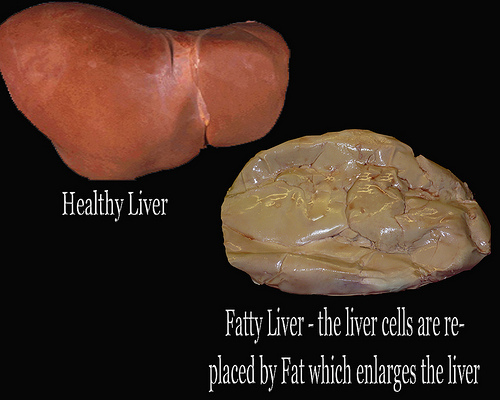 Appearance of significant fatty liver tissue within a calf liver recently analyzed. 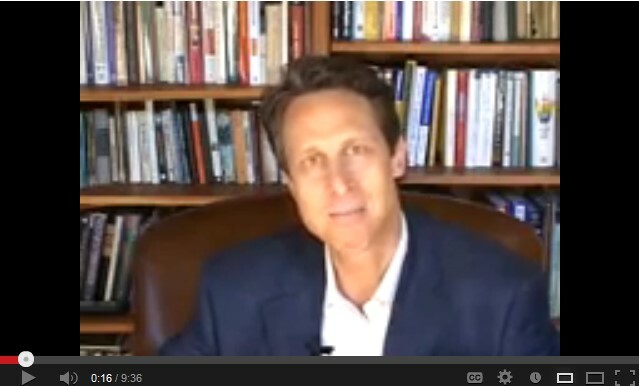 are abundant within the fatty cells. Magnification approx. 8000x. 1. The animal is young, and therefore excess fatty tissue would not be anticipated at this stage of growth. 2. The fat cells are enclosing large numbers of what appear to match (identical in size and geometry) the sub-micron, bacterial-like structures that are the subject of much scrutiny within the research of this site and this current paper. 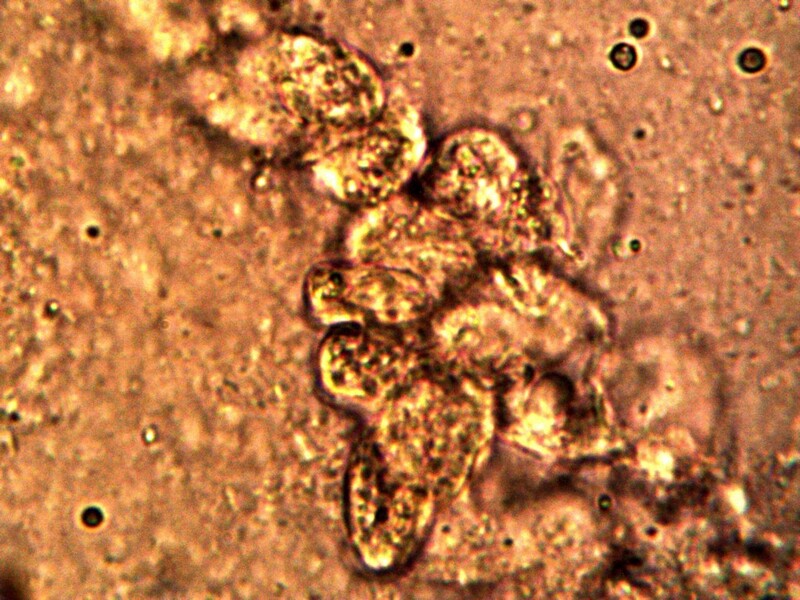 It is reasonable to surmise that the abundant presence of the encapsulating fat cells represents a toxic-overload response by the liver in the young animal. Other issues of equal and concern arise from this recent observation; this research is to be presented at a later date. For numerous reasons, there is a legitimate case for concern about the impact of the Morgellons condition upon the functioning of the liver; this includes potential toxic overload, fatty tissue development and the prospect for an enlarged liver that results. If such proves to be the case, there is an obvious need for consideration of liver detoxification strategies to be incorporated within this report. “The pH balance of the body is very important, and most people’s bodies are too acidic at the cellular level. It does not matter if the saliva, urine or other fluids test alkaline. In almost all cases, the body cells, which is the site of metabolism, are too acidic. This predisposes one to many metabolic imbalances and diseases including cancer. The rationale for drinking alkaline water is that it will correct this important physiological imbalance. 2. Water from alkaline water machines replaces the vital minerals with a little cadmium, lead, arsenic and other toxic metals found in tap water and not filtered by any carbon filters that I am aware of. Some filtering systems claim to filter out toxic metals, but I have not observed this in practice. Those filters that I have seen that are said to remove a lot of toxic metals tend to damage the water even worse. Reverse osmosis is an example of this type, along with KDF and other types of “advanced” filtration media. 3. In addition, the alkaline water machines also replace the good minerals with a little platinum and titanium found in the plates that the water passes over to make it alkaline. These are both supremely toxic metals, especially platinum. In addition, I have observed slightly higher levels of nickel in those who use alkaline water machines for several years. The nickel is probably leached from the stainless steel in the machine, or perhaps from a nickel-plated machine part. Nickel is a deadly toxic metal. The alkalinity of the water may cause a little to be leached out of the machine parts. We can once again see the emphasis upon the alkaline reserve minerals as a major pathway toward the restoration of the acid-base imbalance, with an emphasis upon diet to accomplish this. The verdict on exotic or expensive technologies to alter the “state” of water is left to the reader to investigate further; I would only encourage that the study be rooted in chemistry, biochemistry and physics as opposed to promotional claims. At this point of study the causes of and factors affecting increased acidity, from numerous and varied sources, parallel the summary given by Dr. Lam to us at the onset (please review) remarkably well. These include incomplete metabolic breakdown of foods and nutrients, the lack of availability of sufficient alkaline reserves, the ingestion of acidic toxins or foodstuffs into the body, carbon dioxide imbalances and the failure of the bile system to adequately alkalize the intestinal tract. The road to recovery from the impact of such damage is to reverse the courses above, i.e., increase the efficiency of the oxidation of fuel, assure adequate oxygen in a form that the body can actually use, intake sufficient alkalizing minerals (such as calcium, magnesium, etc.) and improve the flow of bile and improve the digestive processes in general. It is obviously a tall order, but courses of action are readily available to all of us. Consultations with health practitioners about the sensibility or validity of the information being relayed here is a good start in the process. Supporting this process with your own studies and research on the matter can only be of further benefit. Readers may once again be struck by the association between acidity and demineralization; the relationships between diet, body chemistry, acidity and alkalinity are all too apparent in the literature. The preceding section serves as a welcome segue into the realm of what may be rather unsung heroes; those that have devoted themselves to health, nutrition and “functional medicine”. Many of us look to a particular type of “doctor” to “heal” an ailment or disease, but those that study the role of nutrition in promoting health and those that study health in a more holistic sense are likely our true and best allies. There are many individuals that have studied extensively the relationships between oxidative stress and acidity, for example, with nutrition and the body systems in an integrative sense. It is wise for us to avail ourselves of their talent and knowledge, as opposed to only seeking a particular “cure” to a “particular ailment”, including that of “Morgellons”. If we now open our discussion to include the counsel of those that study nutrition as a lifelong passion and its role in our health, the association between health and the acid-alkaline balance is prominent within the literature. For those that continue to advocate that saliva and urine pH have no real value in the assessment process, it may be prudent to become familiar with a portion of the following discussion. For those that seek out the credentialing process, Dr. Biamonte is no lightweight in the profession of clinical nutrition. 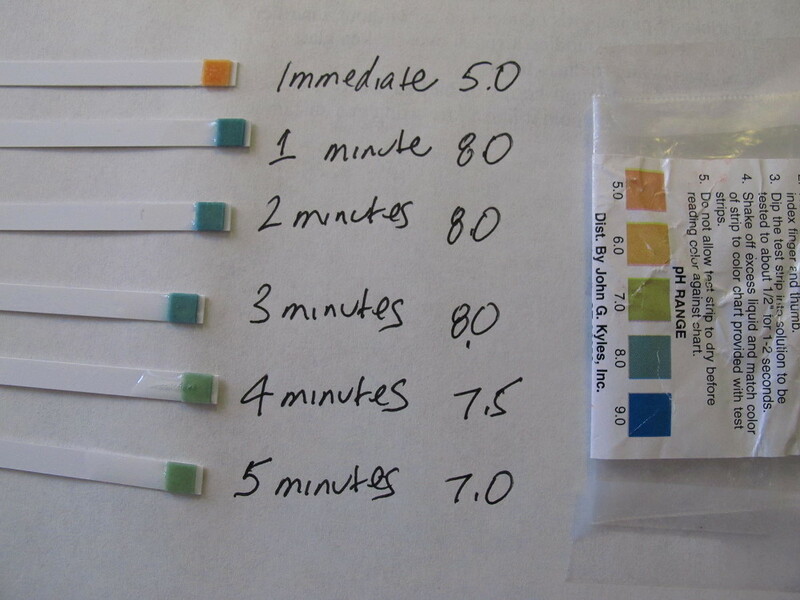 One article worth studying in detail is entitled, “Urine and Saliva pH Testing”108 from the Biamonte Center for Clinical Nutrition. A few excerpts are in order here, but it is advised to study the article in detail. The acid-base balance discussion, the role of minerals (once again) in the process, and various simple testing procedures for both saliva and urine are worthy of your consideration. Please conduct your own research with the critics as well and reach your own conclusions as to motives and intentions of various parties. You may also wish to examine the documented effects of demineralization and destruction of teeth and bone documented earlier in this paper, as well as to study those that have suffered from these effects. The mineral loss in these cases is clear and evident, and it is difficult to deny that the acid-base balance is an important part of the process. All of the following pH tests should be done on same day. 1. Saliva test upon waking. First thing in the morning right when you get out of bed, lick and wet the MIDDLE BOX OF THE PH TEST STRIP. Note the color change and write down that pH number. Do this before brushing your teeth, drinking, smoking, or even thinking of eating any food. This pH should be 6.8. 2. Then test your second urine of the morning. The urine stored in your bladder during the night, that is ready to be eliminated when you get up, should be acid so you don’t want to test that. Drain your bladder in the morning, the last time you get up if you get up during the night and then see what that urine pH is. Again, record this number. This number should be the pH of your urine after you got rid of your acid load from the day before. The acids should be gone the second time you go to the bathroom so your urine pH should be around 6.8 also. 4. Then check your urine pH between breakfast and lunch. . The pH should always be 7.0 to 8.5, a couple of hours after meals. 5. Then check your urine pH between lunch and dinner. The pH should always be 7.0 to 8.5, a couple of hours after meals. 2. How well we treat ourselves in general, i.e. how “strong” the liver is. This is the AM saliva pH. This number shows the overall state of our health, the condition of the alkaline reserve of our bodies which reflects the diet we have eaten over the last months to years. This number stays rather constant and will only change after some work has been done in re-mineralizing the body. Pleomorphism and its changes can be viewed under the darkfield microscope, but the saliva pH shows what you will see. 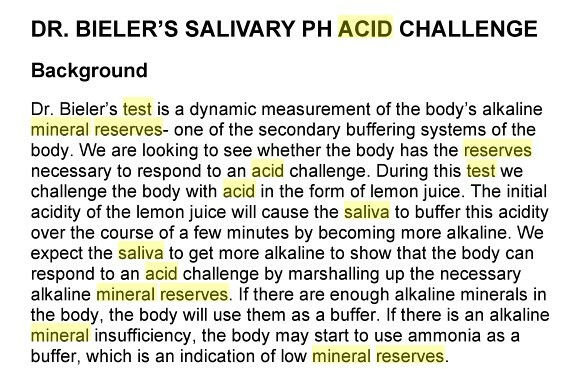 Since the saliva pH is an indicator of intracellular pH, saliva pH readings should never be below the pH of the phosphate buffer system, 6.8. (see below). The most accurate reading of saliva pH is recorded immediately upon awakening–after sleeping at least five hours and before brushing the teeth. It is during sleep that the body removes waste and is in an anabolic state restoring and replenishing the body. If the patient has a saliva pH of 5.5 at this time and only 5.6 after eating, you know that this person has no alkaline reserve and that his body is devoid of the minerals necessary to process food properly–his body cannot adequately respond to the physiological crisis of handling food. 3. The pH of your saliva after you eat gives an indication of what the mineral reserves of your body are (the pH number should increase after you eat). The ideal saliva pH pattern is 6.8 on awakening, 7.0 before eating and 8.5 following breakfast. 4. The pH’s of the urine between meals should be kept in the basic range, pH 7.0 to 8.5. After one eats, the stomach generates the necessary acid to digest the food. While doing this, it also performs the opposite action, i.e. it makes an equivalent amount of base or baking soda, sodium bicarbonate, that is picked up by the blood stream and delivered to the alkaline glands of the body, the saliva, the pancreas and the liver. The maximum amount of base in the blood and therefore in the urine occurs one to two hours after you eat. The body fluids and therefore the urine is most acid at 2:00 A.M. (pH 5.0 to 6.8) in the morning (the base tide) and most alkaline at 2:00 P.M. (pH 7.0 to 8.5) in the afternoon (base flood). Along the course of the article, Dr. Biamonte also introduces us to the “lemon-test”, a relatively simple test that can be used to give an indication of the available mineral reserves in the body. The history of the test and its use extends well beyond any single practitioner, and it is also described in some detail by Dr. Dicken Weatherby in his book on functional medicine, “In Office Lab Testing : Functional Terrain Analysis109“. Various examples of test results are described within this same book. The origin of the test appears to reside with a Dr. Henry G. Bieler, MD.110, the well known author of “Food is Your Best Medicine”. I have witnessed the administration of the test locally, and I find the results to be of much interest and expressive of variation between individuals. The test is simple enough in principle and practice to monitor individually if desired, as in the following example with two separate individuals. The Acid-Lemon Test conducted by two separate individuals. 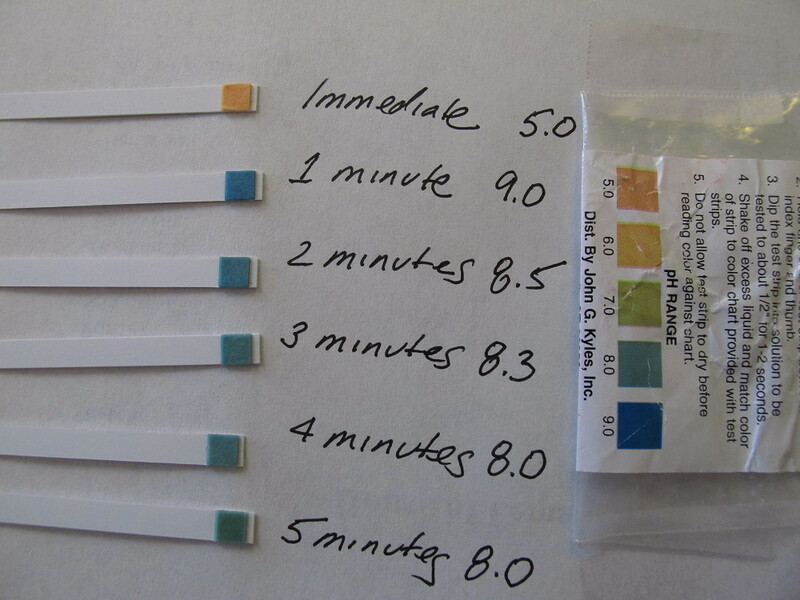 The individual on the right demonstrates a stronger decrease in pH over the time interval measured. The reasoning behind this test concludes that the individual on the right is likely to have reduced mineral reserves available, and consequently a higher acid level may be anticipated within the body tissues. The sharp rise in pH on the individual’s test to the left may apparently also reflect ammonia imbalances and is also worthy of further study. Important nuances in the test do exist and they are worthy of further research; Dr. Weatherby’s book may be helpful in this regard. Additional simple tests for an acid-alkaline imbalance (i.e., breath holding test and respiratory rate test) are described in one of several of Dr. Dicken Weatherby’s books110b on the subject of functional medicine. Any readers with a further interest in these topics may wish to consult those that practice in the field of functional medicine, or as stated repeatedly, the health practitioners of choice. 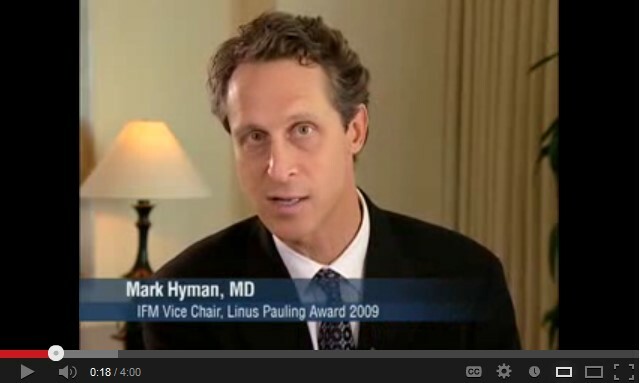 Listen to a more extended discussion by Dr. Hyman on the state of health and Functional Medicine. It would seem as though there are obvious relationships that exist between acidity, oxygen, and energy production when we are dead. There is every reason to think that such relationhips exist while we live as well. We can see that the thyroid is the metabolic master of our system, and it is harder to get much closer to home than that. We also have good reason to suspect that thryroid processes are being interfered with in conjunction with the Morgellons condition. Our most fundamental indicator of this disturbance is that of body temperature. 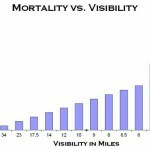 There is good reason as well as evidence to show that the body temperature of the general population is operating frequently at a temperature less than normal. The mantra of “98.6” that many of us grew up with may not exactly be quite so vocal these days, and the mystery of that silence is deserving of intensive study. We also have reason to consider interference from the standpoint of aromatic chemistry; this has been discussed at length earlier in this paper. Essentially, the existence of aromatics along with amines is a perfect setup to initiate the halogenation of the aromatic structure. Halogenation of an aromatic structure by the halogens foreign to the body, e.g., fluorine, chlorine and bromine, is also the perfect setup to interfere with thyroxine, or the thyroid itself. Third, we have a relationship of interference to consider between tyrosine (an amino acid), the thyroid (with thryoxine production) and dopamine (a neurotransmitter), as it has been discussed previously. We will also revisit this topic when the subject of neural disruption is discussed later. No matter which way go about it, we obviously have important issues at hand here, and metabolism and body temperature indicators are the heart of it. We will focus on this issue of body temperature, as it is direct and apparent, and it is easy to measure, and monitor for change. It is a macro indicator that affects the entire body system. Our Biochemistry is essentially non-functional without the proper conditions of temperature and pH in place (for ALL reactions), and we must never lose sight of this fundamental fact as we wade through this maze of complexity and interaction. What does low body temperature mean, at the most fundamental level? It means the body is not working up to speed; the engine is not running at the proper temperature. If the engine does not run at the proper temperature we have incomplete combustion and less energy is produced. In essence, the body is not working as it should, and it is definitely not firing on all cylinders. In more conventional terms, an underactive thyroid is called hypothyroidism and the overactive thyroid is called hyperthyroidism. The signs of research in place point quite strongly to the former in association with the Morgellons condition. Detailed information about a method to monitor your temperature and its variability is available on Dr. Rind’s site as well. The awareness of the state of temperature in the body, its importance to efficient metabolism, and a system to track and monitor temperature on a regular basis may be a beneficial first step in becoming aware of the importance of thyroid functioning to good health. The widespread reporting and observation of reduced body temperature amongst the general population , in addition those those more visibly suffering from the Morgellons’s condition, should make it apparent that hypothyroidism is a central topic of research here. This paper can only hope to introduce the importance of this issue in this and future studies.. If we postulate that a state of hypothyroidism exists, i.e, a state of lowered metabolic rate associated with the lower body temperature cited above, what then are some of strategies offered by the health community to alter this situation? It would certainly seem, then, that the cause of such a problem would need to be identified first. We have certainly called attention in this paper to the possible role that the halogens might assume in such a case, and the interference that the toxic halogens can create. An obvious first approach might be to reduce or eliminate the presence of toxic halogens within the body, and to avoid contact or ingestion of them. Let us seek out how the health communities might react this to this potential problem. It is more than explicit at this point that no medical advice is ever given or implied within these papers, however, information and education IS to be freely available to all. 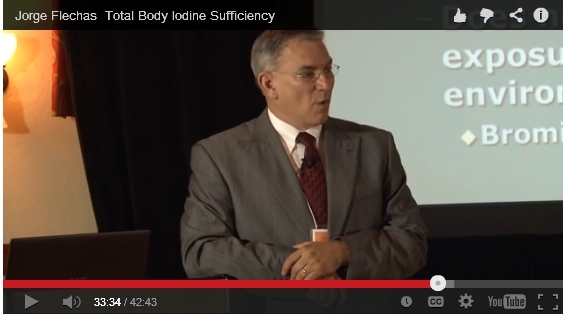 It is clear from the literature and research that iodine supplementation in connection with thyroid performance is extensively discussed and employed. The chemical and molecular rationale for that strategy has already been made clear within this paper; the details of consideration and application will be left to the reader. The responsibility for education and professional consultation in any such matters is also equally obvious. 2. 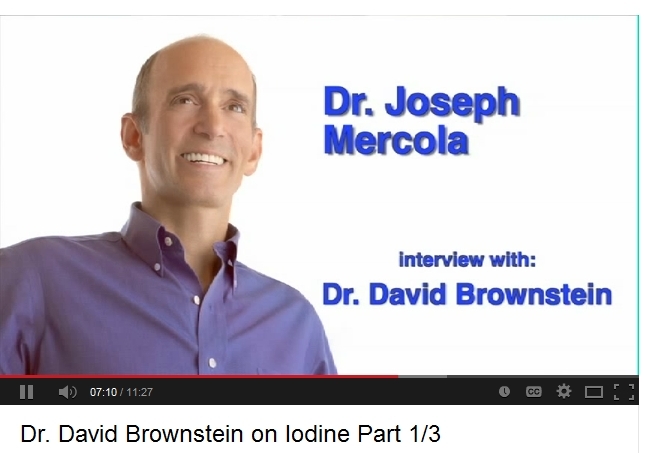 Allergic reactions to iodine supplementation are known to exist. The extent and reaction of an allergic reaction is certainly outside the scope of this article, but attention will at least be drawn to the matter. 3. Another question that can be asked, similar to those issues that were raised earlier with respect to deficiencies in iron, is whether or not we take care of a deficiency by simply adding more of the same thing back into the system? If we do not understand what is causing the deficiency of a particular substance to begin with, supplementing it with the same substance may be a completely futile exercise. Hence the interest of “Thyroid Inhibition” increases, and consequently the interplay with iodine remains a focal point of the strategies discussed here. Self-tests for adrenal function are subsequently described in this article, but the point is again made that thyroid hormone supplementation may be a diversionary exercise. Education and research are the goals here, not therapy. Education and research are obviously on the path toward therapy, and these are our pursuits. Once again, we may ask, does this sound familiar, relevant and germane to the findings of this report? Readers are referred to Dr. Weatherby and other sources for more particular details on the interpretation of the test results. There are those who think that the iodine patch test is not reliable and therefore not useful; as such it exists in controversy amongst some practitioners.119 It would appear that the lower body temperature test is less so and it is simple in principle to comprehend. Recall from earlier discussions that all biochemical reactions take place at a specific temperature and pH; alteration of either of these parameters will inevitably lead to impairment of some sort or fashion. 1. Tincture of iodine – a mixture of elemental iodine and either potassium or sodium iodide, dissolved in ethanol and water Denaturing of the alcohol is also know to be used in commercial tinctures. 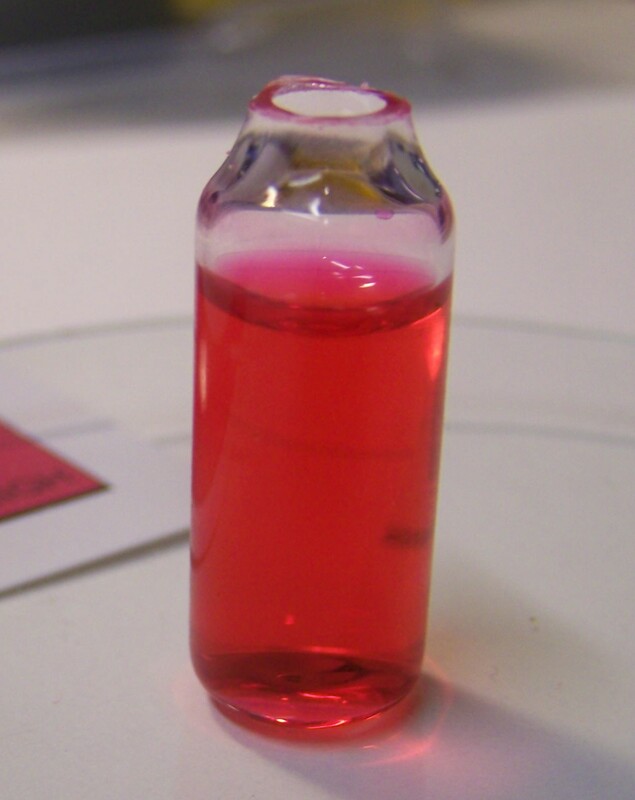 A 2% free iodine solution contains about 1 mg of free iodine per drop. Ethanol is poisonous in sufficient amounts and denatured ethanol is deliberately poisoned to prevent consumption. Tincture solutions can vary between 2% – 7% in strength. The following media presentations are recommended as an introduction to the important role that sufficient iodine and iodide levels plays with in our health. More extended discussions of the necessary levels of iodine in the body, the manufacture and storage of iodine, differences between iodine and iodine forms, body capacity and removal of excess iodine, skin issues related to iodine deficiency, the damage and competition for iodine by the halogens, the dangers of the halogens with respect to modern diets, and improved brain functioning with appropriate iodine levels are all important topics that are covered in these presentations. The reader is advised to become familiar with the material that follows. We can see from the presentations by numerous doctors and extensive research that there is a strong case for the existence of increased levels of toxic halogens in the body (i.e., fluorine, chlorine and bromine) and for the competition that they exert upon iodine and the thyroid. This case in in alignment with the spectral and biochemical analyses that are a core result of this paper.The symptoms of impaired thyroid function such as reduced body metabolism and energy production, lowered body temperature, skin complications, brain dysfunction, cancers and many other serious health issues are intimately related to iodine deficiency. Iodine therapies are also offered as a significant prospect for improvement by these same doctors. The case for the existence of the aromatic halogens in association with the Morgellons condition has also been made by this researcher through the use of infrared spectral analysis, with a particular interest in bromine substitutions. It is also important to emphasize the major differences in the amounts of iodine that are necessary and utilized in the body compared to those identified in the federal standards; this difference ignores the prospect of increased competing halogen sources that may now have been introduced into the body. This difference, even based upon conventional medical research of recent decades as outlined in the presentations above, is on the order of 100 times. Impairment of thyroid functioning and iodine supplementation therapies exist, therefore, as compelling and major topics of further research in the investigation of the Morgellons condition. We now begin to close this chapter of research in the history of Carnicom Institute, and we depart (temporarily, of course) with a brief revisit to, and a discussion of, the neural disruption issue. It is difficult to ‘rank’ the relative importance of the numerous issues that have evolved within this current research and their combination is devastating and ostracizing to far too many. This level of harm and suffering is much greater than that which is currently acknowledged, and many individuals deserve recognition for the battles they are fighting. These battles are often fought in solitude and they can be literally a fight for life itself. We must offer our compassion, our care and our help in haste, as the frog pot continues to warm for most of us. It is clear that cognitive functioning, concentration ability and mental acuity in general are companions of study here, and that they are closer to home than many of us would like to admit in our pursuit of improved health. The technical and evidentiary argument for this situation has already been made in this report, and our question here is what can be offered as a prospect for improvement? Certainly the first fact to recognize is that the broad health impacts that have been discussed here are usually related to one another, and it is simplistic to separate them as islands of trouble. How can we possibly suspect a simple ‘cure’ to any demise of neural and cognitive functioning; in the majority of cases modern medicine is still in its infancy here. Nonetheless, there are ALWAYS paths to pursue to improve the lot of us, and there are no exceptions here. We see the consequences of oxidative stress over and over, and at this point we are not entitled to remain ignorant of what we can and must do to improve the situation. The details and important role that anti-oxidants play in combating oxidative stress have been repeatedly emphasized in this report. 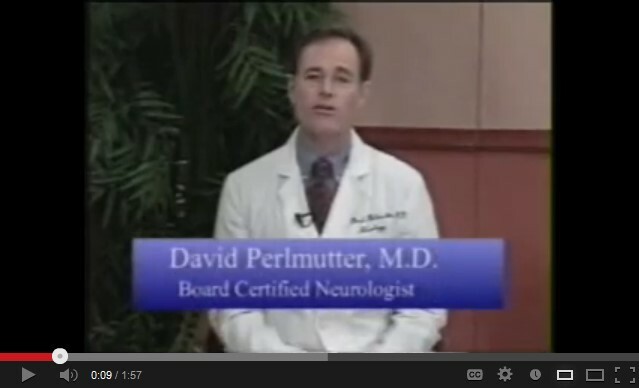 We must take advantage of that same information here as it relates to neurological functioning. We have also introduced leading research on the importance of glutathione as it relates to neurological diseases and Parkinson’s disease. It should be recognized that glutathione is one of the most powerful antioxidants known, and from the above, it should come as no surprise to us that its effectiveness against oxidative stress is important to neural functioning. The importance of understanding the precursors of glutathione (e.g., N-acetyl cysteine (NAC) and alpha lipoic acid) vs. dietary supplemention or ingestion has also emphasized in this paper. Through the introduction of iodine therapies that are practiced to improve the functioning of the thyroid, we have also learned that adequate levels of iodine are also strongly related to mental functioning, acuity and intelligence. This topic is especially prominent in the presentation by Jorge Flechas, MD, above. We have also learned that the difference between the federal guidelines of minimum daily iodine levels and the levels deemed beneficial by certain medical practitioners is dramatic, to say the least. This dosage issue is entirely independent from any need to compensate for the potential reduction or removal of iodine stores within the body by competing aromatic halogen compounds (as they have been identified and postulated within this report). We have also called strong attention to the intriguing and serious implications of oxydopamine and its related compounds within this growth form. There is a strong case in the data of this report for this type of existence, and the damage that these compounds have upon neurological function is unambiguous. 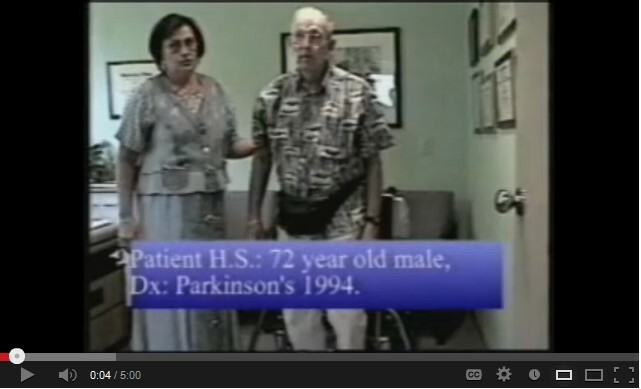 Recall that such compounds are used in the laboratory to deliberately induce Parkinson’s Disease. Such compounds reduce dopamine and brain amine levels and this, as a minimum, is known to affect memory loss and cognitive functioning. With respect to the potential mitigation from this effect, oxidative stress is responsible for dopamine loss129, so this is now a familiar refrain to us. The role of antioxidants has been discussed at length in this report, and this presents the roles and use of vitamins (e.g, A, B, C, D, E), enzymes, and the precursors to glutathione for example. Readers and health practitioners will also want to investigate the role of tyrosine and L-tyrosine as they relate to dopamine levels in the brain. Tyrosine is an amino acid, and it is the building block for dopamine as it has been discussed. The prospect of structural interference in the synthesis of dopamine has also been raised within this report, especially with prospect of halogen substitutions on the aromatic ring of tyrosine. The role of diet and nutrition is also important to dopamine levels.130 I am hoping that it is now understood, from the journey that has been shared, that this researcher advocates nutrition as one of the primary pathways towards better health, and that those who are knowledgeable in such ways deserve our greater recognition and attention. They have been driven to the heart of the matter, and that is that all life will eventually be a product of the nourishment that it consumes. The business of “supplementation” is essentially a band-aid to attempt to compensate for a deficiency that never should have existed if we were wiser and more complete in our ways, especially from youth onwards. Two additional points of interest are also mentioned in this report. The first is the recognized benefits of enzymes (specifically, ‘kinase” enzymes) to brain functioning. Notice also that even though the size of the brain is quite small relative to the body, it ends up using significant amounts of oxygen during mental activity. The availability of sufficient oxygen and body’s ability to use this oxygen effectively are obviously of importance here. We see once again that it is a hopeless exercise to seek out singular causes, effects and ‘cures’ to the complex health problems before us, and the joint appearance of antioxidants and enzymes in the crusade against oxidative stress has again made its mark here. Another word of importance within this paper concerns the regeneration of brain neuron cells, termed “neurogenesis”. This work shows that adages die slowly, and that it is only recently accepted in the mainstream scientific community that the brain is not a fixed organ which can only deteriorate with age. The research shows that brain neurons can be regenerated, albeit at a slower rate, at more advanced ages with proper nutrition. This means “new” brain functioning and development can continue in the aging process and that “disease” is not a fixed sentence. One must be careful of old adages, lest we become fixed ourselves in our ways, thinking methods and perceptions. Additional well known natural approaches to improve mental clarity and function include those of Gingko Biloba and CoQ10. Whether or not these particular supplements will be of known benefit with the Morgellons situation remains to be seen; they have, however, established reputations with respect to improving mental clarity and memory loss. The following paper133 discusses a series of natural remedies to enhance memory and mental function, and it is anticipated that they may be of some benefit. It is a primary argument of this researcher that the solution to a problem is not necessarily found by introducing additional complexity into the situation. The case for “supplementation” of diet to compensate for health problems is a primary example of this dilemma. If one has known sources for health problems, it is usually wiser to eliminate the source of the problem rather than try to compensate for it with an infinite combination of variables, such as pills, supplements, or drugs, for that matter. The proper approach for the “Morgellons” condition, as with any health impairment or “disease” is to strike to the source of the matter. If the cause or source of such a condition can be identified, it is to be removed or stopped in its tracks, if at all possible. It is not be be accepted as intrinsic to the environment and then compensated for with a myriad of protocols, drugs, treatments, and supplements in a state of perpetual uncertainty and ignorance. A body of information is available to those who wish to seek it out, and this information (along with your participation) can be a pathway towards striking at that source of health and disease. The general population, the health communities, the professional communites, and the governmental structures are obligated, as has been stated repeatedly, to combine, use and express their knowledge and talents to improve the state of the environment and the health of the people. We, our children, and our future children deserve no less than this, and the entire world deserves the more of it. This episode of research now comes to a close; this paper has taken more than a year to complete and additional needs remain before us. Additional work will be done in the future to summarize and consolidate the essentials of this research. Work of this nature is a journey in itself, and I do not know where it will lead and end when I start. The process of identification, correlation and analysis has now taken place, and it is hopeful that it provides a beneficial foundation from which we may accomplish greater things in the future. I thank you for your patience and endurance to reach these closing comments and I hope that the work has been of value to the general readership. The future remains to be influenced by the decisions and actions that we now take together. 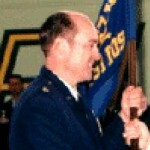 (born Clifford Bruce Stewart, Jan 19 1953). Appreciation is extended to Lucretia Smith and Dr. Jimmie McClure for their sustained interest, research and communication to CI over a period of several years about the importance and relevance of thyroid issues to the work presented here. These individuals, along with others, deserve credit for their prescient assessments of the role that thyroid dysfunction is likely to play in the “Morgellons” condition. Many thanks to both of you.